Elgrim's Elixirs is a damp alchemist's shop located on the lower level, by the canal that flows through the center of the city of Riften. Owned and run by Elgrim and his wife Hafjorg. It is opposite the entrance to Beggar's Row, near the northern watergate to Lake Honrich. Few and Far Between: Help Ingun restock Elgrim's rare ingredients. The proprietor Elgrim praises its location as ideal for keeping his ingredients fresh, but his wife, Hafjorg complains that it is merely the only location he could find that they could afford. Elgrim and Hafjorg both sell merchandise, although they share the same merchant chest and basically the same purse. Ingun Black-Briar is also found in the store during the standard opening hours, as she is apprenticed to Elgrim who is training her to be an alchemist. Upon entering the shop counter is in front of you in an L-shape coming out from the end of the partition wall. Hanging above the partition wall are three pheasants, two rabbits, three garlic braids, four bunches of elves ear and two bunches of frost mirriam. 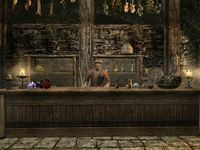 Behind the counter are two sets of shelves holding a selection of ingredients, potions and poisons that are displayed merchandise. On the counter are more items that are displayed merchandise, including those hidden inside a stone bowl on the counter or hidden under the counter along with an iron dagger, a giant's toe and a copy of Nords Arise! In the southeast corner is an alchemy lab with a barrel containing ingredients behind it. There are two chairs with a small table between them in the northwest corner, with a pile of firewood behind. There is a large fireplace in the west wall, with a wall shelf to the left holding a bottle of wine and a pile of food sacks underneath. In the southwest corner is a crate with a bunch of lavender on top and a small round wooden table and three chairs in front. On the table is a seared slaughterfish, a salmon steak, a sweet roll and a bottle of wine. Near the middle of the south wall is a cooking pot on a stand with food sacks next to it. Against the back of the partition wall are three barrels, two of which contain food while the third contains ingredients. 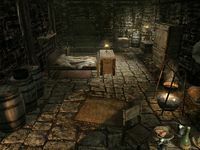 On top of one of them is a copy of Palla, volume 2. to the right, in the middle of the wall is a double bed coming out from the wall with an end table holding an apprentice locked strongbox to the right, a wall shelf above holding a bottle of alto wine and a dresser at the foot of the bed holding a bunch of tundra cotton. 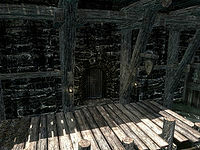 Opposite, against the south wall is a wardrobe containing clothes, with Ingun's Alchemy Chest--(see notes) to the left along with a food barrel with a bottle of Nord mead on top in the southeast corner. Against the east wall is a crate with the business ledger on top and a wardrobe to the left. The following items are sitting out in the store, for example on the store counters. They can be purchased from the merchant, or else can be stolen. Other items may also be present in the store, but those other items are not available for purchase. This is the merchandise found in the store's merchant chest. These items are only available if purchased from the merchant; they cannot be pickpocketed or stolen. They are restocked every two days. Completing Ingun's quest provides you with the key to her alchemy chest. It also allows you to freely take the contents of several barrels in the store. Even if you complete Truth Ore Consequences, taking any of the other items in the store is still considered stealing. In particular, you are unable to freely take any of the alchemy ingredients sitting on the store's shelves and counters. These are available after also investing in the store, however. There is a Loot shadowmark to the left of the entrance door. There are several alchemical ingredients, potions, and poisons found around the store. The store is always open for business, even in the middle of the night, and even if the merchants are sleeping. Simply engage conversation with the merchant and you will always be able to trade with them. This page was last modified on 24 March 2017, at 05:29.